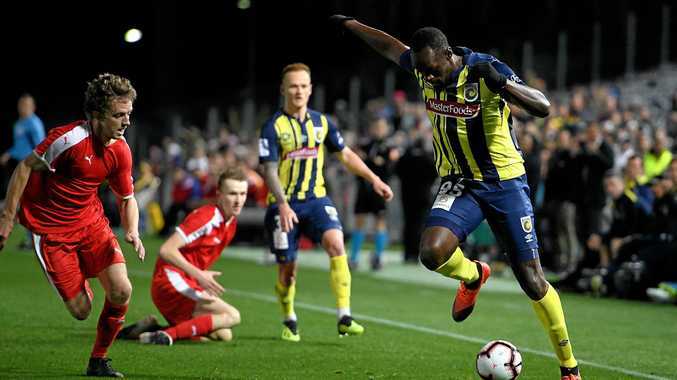 HE'S still yet to sign a contract with the Central Coast Mariners but Usain Bolt is indirectly responsible for the A-League club's biggest on-field splash in years. The signings of Ross McCormack and Tommy Oar have been described by owner Mike Charlesworth as a "defining moment" for the Gosford-based minnows. According to CEO Shaun Mielekamp, it can all be traced back to eight-time Olympic champion Bolt - in a roundabout way, at least. The Jamaican sprint king's magnetic presence, the sponsorship dollars and publicity he has attracted - plus the 10,000-strong crowd he pulled to a trial match last month - have all dramatically accelerated a process of rejuvenation that was already under way at the club. "It's a funny one," Mielekamp told AAP. "They're not directly connected but you know that if one didn't happen, the other wouldn't have happened either. "It just gave us that confidence to have a go." For the past four seasons, the Mariners have spent the bare minimum of the salary cap. The frugal approach from Charlesworth yielded predictably miserable results: two wooden spoons and two eighth-placed finishes. "When we looked in the mirror, we knew we needed to change," Mielekamp said. "So the mentality changed through the off-season and was about who we want to be as a club and where we want to get to." McCormack's season-long loan deal and fringe Socceroo Oar's two-year contract are proof the purse strings have loosened and the mindset has shifted. The Bolt experiment, while controversial among soccer purists, has played an undeniable role. The same agent who facilitated Bolt's "indefinite training stint" at Central Coast, Tony Rallis, orchestrated McCormack's loan from Aston Villa - where the Scottish striker was again frozen out of first-team action despite scoring 14 goals in 17 games last A-League season for Melbourne City. "It's just been one little bit after another that all connected," Mielekamp said. "The best way I can describe it is for the first time, I've had to go back and check we're under the cap. "When any business starts showing indicators of growth, the more likely you are to invest. "We have shifted from a cost recovery, fighting for survival-type business structure to a growth phase." Coach Mike Mulvey now has a squad at his disposal with enough firepower to mount a legitimate finals bid. "We're nowhere near the finished article," Mulvey told AAP. "We're just starting to grow, and these two players add to the culture and quality we've got in the squad." premium_icon Is it time to take Bolt’s A-League dream seriously?